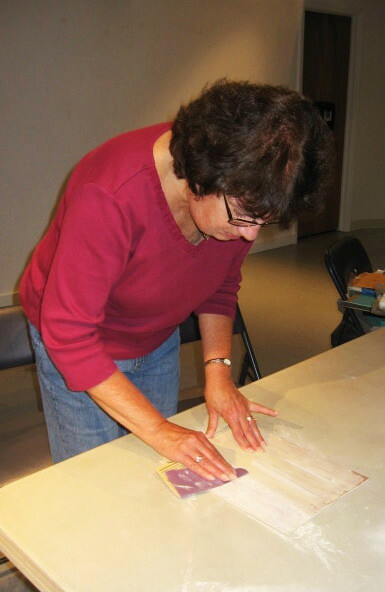 Tonight was the opening night of my new woodcut workshop at the Belmar Arts Council. I got there plenty early so that I could have everything set up. 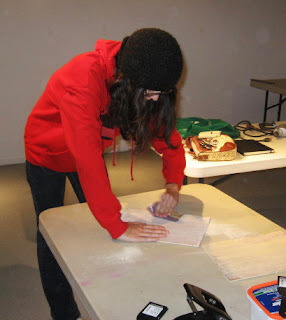 Being the first night, I brought a lot of print examples, so that the participants could see some of the options for working with the relatively simple process of woodcut. We went through a few group folios (mostly looking at the relief prints), and highlights of some of my work, along with some more experimental pieces. Then we got down to work. First I had my new students describe what kind of print they would like to try to make- subject, process, etc. Then I helped them each prepare a woodblock. I cut two 9" x 12" boards, and we used wood filler to surface them, including sanding them smooth (see above and below) I drilled holes in one block to allow that artist the possibility of registering some form of color later. That was enough for the first night. I asked them to have a drawing worked out by next week, at least on paper if not the block itself. I should have some new cutting tools for them by then. They left, I cleaned up, packed the car, shut the building, and went home. On a side note, this post marks a milestone for the blog- the 1000th entry on this blog. Took not quite 5 years to reach this point. I probably have more than a 1000 more on my various other blogs. A good chunk of that is work related, but obviously I have spent way too much time on the computer.